“We have the phrase 'a pot calling a kettle black' which means trying to get the attention off you by blaming somebody else. There's no doubt that ratings agencies did a terrible job all the way up until 2008, but we have to be careful now about who's criticizing them and why they're criticizing them before we can say whether that criticism is actually valid. To be fair, if S&P did make a bad decision in downgrading US debt, I think that the problem with the decision is that it should have been done sooner, and maybe it should have been an even starker downgrade than it was because it's very unclear to us that the US deserves its current credit rating. There's a whole bunch of systemic risk in the US system that means, to our mind and certainly to the Chinese and independent rating agencies such as Egan Jones, there's a lot more risk in US sovereign debt than a AA rating would even imply. We have to look at why they're giving these ratings and really what is a fair basis of criticism or not. One thing that strikes us that when we're creating portfolios, we don't really take into account what S&P, Fitch's or Moody's might think about a particular security. As president Roosevelt said, ‘There's nothing to fear except fear itself.’ What actually happens is that no competent professional managers actually pay any attention to the S&P, Fitch's or Moody's ratings, but what happens when they get downgraded is that investors worry that other people are going to pay attention and then it actually becomes a self-fulfilling prophecy that you had better sell because everyone else is going to start selling even though you might not agree with what the S&P rating might be. As Paul infers, the real problem is that no-one really knows what the credit agencies' role should be and, despite this, people still apply too much faith to these things. On one hand, we have professional managers who do not really take the ratings particularly seriously and use their own research and their own ideas. On the other hand, we have parts of the market that still apply too much faith to the agencies. People might say that one way round that would be to introduce regulations, so rating agencies are now covered by Dodd Frank. Also, we have the S&P leak that France was going to be downgraded being investigated by the ECB. What concerns us is, with all this going on, these are meant to be independent bodies that are going to be giving opinions about, say, the US government, and if they are going to be regulated by a US government body, but they are going to be giving negative opinions about the US government, again that is getting into the conflict of interest area as well. Going forward, it is very difficult to see what the role of the credit rating agencies will be. What we would say is largely to tend to ignore them. Get proper professional analysis of any particular security - do not just rely on the fact it has got a particular label given to it. If the ratings agencies are still doing anything wrong today, they are still being too optimistic about stocks and securities and for too long. Lehman Brothers was AAA rated virtually until the very end. Irish sovereign debt was AAA rated until 2009, which was two years after the crisis began, so there is a real concern that if they are still doing anything wrong, they are actually still being too lax. “Quite apart from just looking at the individual actions that the credit rating agencies are taking, which are very interesting in themselves, I think there's also a bigger picture here that's to do with the whole investment market, the whole economy and even everything to do with human behaviour. “When you play golf, if you take one shot more than you're supposed to take, they call that a bogey and the reason for that is that centuries ago in Scotland, people used to imagine that they were playing against an imaginary opponent, a bogey man, and if they got one shot less than the bogey man, they won the hole, so they had someone to blame, basically, if they lost. And I think one of the questions about the ratings agencies is, do they just exist so that there's somebody there who can quantify things that really are measurable? That's how credit rating agencies really started out in life. At that stage, they were working for investors. Investors used to ask credit agencies to assess individual securities and the agencies would come back with reports saying, ‘yes it appears their credit is good and their business model is good,’ but they were paid by investors to do that work. The other thing is maybe we're expecting these guys to go and measure things that really aren't quantifiable at all. We're asking them to give ratings on things that you can't measure. “Nassim Taleb has written a couple of books about the fact that we all want to create order when actually things are completely random. Both ‘Black Swan’ and ‘Fooled by Randomness’ explain this concept that we all try to arrange things into patterns when patterns maybe don't really exist at all. I think one difficulty for ratings agencies is that in 2011/12, we don't really know what they are. We don't really know exactly what job we're expecting them to do. They're no longer just working for investors. If investors want to get information about a particular stock or bond, they don't really base it on what a particular credit rating agency says, and they don't really have that direct relationship any more. The credit agencies aren't really working for them. In 2008, we became very uncomfortable with the fact that the credit rating agencies had been working for the companies whose sub-prime securities they had been rating. That made us very worried about conflicts of interest. We're not really sure what credit rating agencies do and who they do it for. “If I can use another sporting story perhaps - when we saw Secretary Tim Geithner famously go on TV to say it was a terrible decision for S&P to cut the US credit rating from AAA, we were reminded of a couple of female athletes in the 1930s, Stella Walsh and Helen Stephens. In the 1936 Olympics in Berlin, Helen Stephens beat Stella Walsh to the gold medal. Stella Walsh and all her fans were so upset that they accused Helen Stephens of being a man. As a result, Helen Stephens had to undergo a lot of testing, and it turned out she really was a woman. She may have been bigger and stronger than most but she really was a woman. The allegations were completely unfounded. Our friends at MitonOptimal are multi-managers and, as such, they do not pick individual equities, but rather focus on sector selection and let the asset managers make their top stock picks for them. Furthermore, given the mercurial nature of markets at the moment it is hard to pin one’s hopes on any one stock, as it is their view that we are currently in a trading market and, therefore, a buy and hold strategy is not the correct approach right now. A sector that they believe has the potential to produce good returns in this current environment is the gold sector, where there is currently a major disconnect between the individual share prices and the gold price. In discussions with asset managers such as Daniel Sacks of Investec Global Gold and Ian Woodley of Old Mutual Gold Funds, it is clear that the managers are pretty bullish on the sectors, particularly given that ratings are incredibly low and gold companies are cash flush. Both managers have the ability to buy the gold commodity ETF in their funds, but have chosen lately to reduce their physical ETF and instead buy the gold miners, as they believe the better opportunity now lies with the shares. To labour this point, it is estimated that the sector as a whole is pricing in a gold price value of $1500, a significant discount to the current gold price of $1740 - this article was written in early February. Ian Woodley’s view is that, despite the more recent change to a ‘better’ environment for risk assets, there has been no concomitant retreat in gold share prices. The anticipation of more quantitative easing, higher developed market inflation and lower interest rates for longer may be a reason why gold stocks can continue to be attractive even when risk appetites are increasing. Ian reports that gold demand from China and central banks remains strong and can underpin a gold price in a range between $1650 and $1800 per ounce. 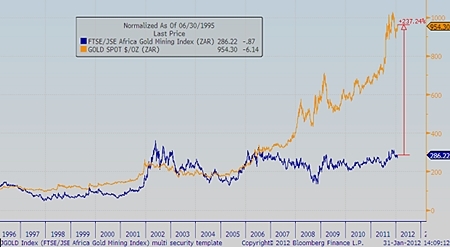 Analysts are predicting that earnings of gold miners will be ridiculously good in the near term. JP Morgan Analysts, Steve Shepherd and Allan Cooke, said the average gold price received in the September quarter was a record SAR391,250/kg, thanks to the gold price rising by 13% and the Rand depreciating by 5.5%. On the negative side, however, labour disputes and wage increases of over 9% will not have helped. Thanks to slightly improved production levels and substantially higher gold prices, the likes of AngloGold’s earnings should increase by 50% and Harmony’s are expected to double. The other important catalyst we believe that will propel the shares higher is the anticipation that the South African gold miners are now going to pay out some of these high cash earnings in the form of special dividends, or share buy backs. In 2011 Newmont (the world’s second largest gold producer) announced a dividend policy that is linked to the gold price. This firmly nails their colours to the mast and will force the company to pay increased dividends in the future. Post this strategy, the share has massively outperformed the S&P 500 and Gold Mining company management in South Africa are said to be eyeing this dividend policy quite carefully. In a world of low yield, higher dividends might just be the recipe to drive the sector higher. * In a world where cash returns remain unattractive, investors are forced to assume additional risk to generate inflation plus returns. Historically SA investors had comfort, as cash yields generated real returns on average of 3% p.a. - at least since 1993. However, these days real interest rates are now in negative territory. * In the developed world, dividend yields from the global top 100 stocks currently exceed those of bond yields. Recent information from the Old Mutual Investment Group shows the historical differences between the dividend yields of these companies and a flat average of the US, UK, Japan and Australian sovereign bond yields. It demonstrates that current dividend yields of these large companies are more attractive relative to bond yields. Given both scenarios make it clear that domestic and global investors need to assume additional risk to gain real returns on their savings, a golden opportunity may be gold equity. Buy backs can be seen as a signal of confidence in a company's future. They are also attractive because, unlike dividends, they are one-offs, and imply no continued commitment to pay out. Last year US corporates spent USD336 billion buying back their own shares. Also, dividend payout levels are not high by long term yardsticks but have risen over the last year. Of course there is another option for corporate cash piles - and that is to hold onto them. Four years after the onset of the global financial crisis the world remains an uncertain place. From uncertainty about the future of the Euro to worries about an Iranian blockade of oil supplies coming through the Straits of Hormuz, corporates face a dizzying array of risks. High levels of corporate cash could be seen as an insurance policy against such events and so companies will just carry on hoarding their cash. For governments focused on getting growth back, this is not the right answer. Institutional investors may also start to ask why, if corporates cannot find a good return on their cash, they do not return more of it to shareholders. For us the key to unlocking these cash piles is to give corporates a greater sense of confidence about the future. This is heavily dependent on governments running the right economic policies. High levels of corporate cash may, in part, reflect corporate scepticism that governments will be able to re-boot growth. So, we see the Democrats saying they need to tax that, but they are not prepared to cut the running costs in the economy. Therefore, as any sixth form economics student can tell you, there is no way you can generate enough extra revenue through taxes unless you cut costs as well, otherwise we are still going to be running at an annual deficit. The Republicans, on the other hand, are saying they want to cut costs, but they are not prepared to raise taxes, so we have the worst of both worlds. You need to do both of these things. You need to do something to fix the stock of the debt, i.e. how much debt is outstanding - and in reality we think a lot of that has to be written off. A lot of the assets have to be written off and a lot of the debt has to be written down. Also, you need to fix the flow of the debt as well, so you need to fix the annual deficit. Just fixing one is not going to solve the problem. If you somehow cut the debt but you do not stop the deficit problem, then you are just going to end up in the same situation again in a few years time. If you actually do something about the deficit, but you are not cutting the actual stock of debt that is outstanding, you have still got this 100% debt to GDP, and that is a real drag on economic activity and economic growth. I do not see anyone saying that a compromise between Republicans and Democrats is possible. Without doubt, if you increase taxes and if you cut government spending, then you are going to have a fairly ugly situation, in fact, you are more than likely going to have a depression - not something any politician wants in election year. At the very least, you are going to have a very nasty, prolonged recession, but unfortunately that is the only way out of the situation America is in with so much debt. Maybe the favourable response by some of the American population to the State of the Union speech, and trying to see some positives in there, is what the politicians want to hear but we think it is no more than sticking your head in the sand. We believe that too much of America is in denial, and they are not really facing up to how bad the situation is and how drastic the measures have to be so as to get rid of that stock of USD15 trillion of debt. They also have to face up to the fact that they are running a USD1.5 trillion annual deficit. They have to cut their spending and increase taxes. As stated above, this will almost certainly provoke a very severe recession, maybe even going back to the depressionary days of the 1930s, but then that will allow the necessary adjustments to happen. That will allow debt to be written off. It will enable debt to get back to manageable levels, and from that point growth can start again. This has always been part of the historic cycle, but this time people are doing everything they can to delay that and kick the problem further down the road thus making the result bigger and nastier when it does finally happen. Eventually you run into the situation where you just cannot borrow any more. Greece has a roughly similar debt to GDP ratio as America does right now, and we are all seeing the problems Greece is having in raising money. Obviously, America's got a lot more global credibility and clout, so we should not really compare it to Greece as an economy, but that same problem will happen - just at a higher level for America. There will come a point where borrowing money is extremely difficult, and if you cannot borrow it externally then the solution is, God forbid, to print it. Printing money is inflationary, as we saw in QE1 and QE2, so if you are not careful you end up in a situation where you have no growth or very low growth, and very high inflation. This means that the growth in real terms is negative and that is when the whole thing starts to implode. If politicians do not decide to adopt these policies themselves (we cannot think of any politicians who have ever decided to do right by the people when it comes to this sort of thing as it may mean they will not get re-elected) and so bring on a recession when it is necessary then the markets will decide that. Now, how much longer America is able to maintain this is a really interesting point because if they keep it going all the way through 2012 then we are into the election cycle, and it may well have an impact on whether Obama manages to get re-elected or not. If it all flares up during this year, we will see some pretty ugly effects on the market. Basically, will Obama put himself or the American people first? It is a shame that he and other politicians do not heed the words of one of his predecessors, Harry Truman, who said, “Anything can be achieved providing nobody minds who gets the credit”. Time is running out.